Positive selection plasmid for the incorporation of ncAAs in response to the amber stop codon. Screening the whole library for its ability to incorporate the desired ncAAs specific would be too time-consuming. We decided to create a high throughput method for the selection of the clones that incorporate the target ncAA. The selection system is based on two selection steps that have to be repeated several times. In the first step, the positive selection, all clones that incorporate amino acids in response to the amber codon survive. The second step, the negative selection, is to select for specifity of the tRNA/aminoacyl-synthetases. For both selection steps the library is cotransformed with the selection plasmid in pSB3T5 to prevent incompatibility to the library plasmid in pSB1C3. The plasmid charts of the selection plasmids are shown below as BioBricks. 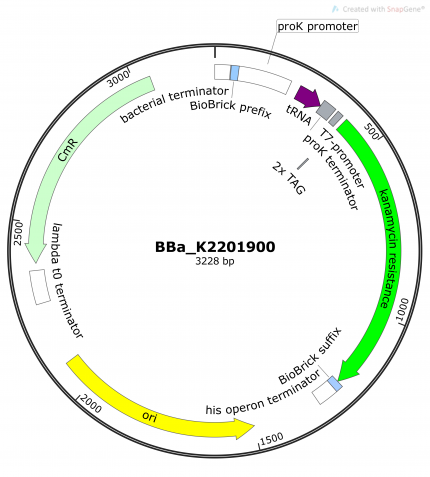 The positive selection plasmid (BBa_K2201900) contains the Methanococcus jannaschii based tRNA (CUA) with an anticodon for the amber codon under the constitutive promoter proK. The essential part for the selection is the kanamycin resistance with two amber codons behind the translation start. If the tRNA/aminoacyl-synthetase mutant (encoded on a cotransformed library plasmid is able to charge the tRNA (CUA) with any amino acid) the cell could express the kanamycin resistance. Thus, these cells survive when plated out at LB agar plates with the ncAA and kanamycin. The positive selection plasmid is always used in combination with the negative selection plasmid (BBa_K2201901) , when selecting clones that incorporate the target ncAA. Figure 1: Positive selection plasmid. The positive collection plasmid contains the CDS encoding for the Methanococcus jannaschii tRNA using the amber codon, a T7 promotor and a kanamycin resistance with two amber stop codons. In the negative selection only the cells that specific incorporate the ncAA, and not any endogenous amino acid, should survive. Therefore, the negative selection plasmid (BBa_K2201901) contains a toxin for E. coli, the barnase. Two amber codons are incorporated at permissive sites of the barnase and the plasmid contains the same tRNA (CUA) as the positive selection plasmid. In contrast to the positive selection, the cells are plated out on agar not containing the ncAA. Thus only synthetases charge the tRNA (CUA) which charge the tRNA with endogenous amino acids. These cells express the barnase and die. Our goal is to generate a tRNA/synthetase which is able to incorporate 2-Nitro-L-phnylalanine, used for the photocleaving of the polypeptide backbone. For the first round of selection, we cotransformed the library plasmid BBa_K2201400 with the (BBa_K2201900) and cultivated the cells on LB-plates with kanamycin and 2-nitrophenylalanine (2-NPA). Due to the amber stop codon, integrated in the kanamycine resistance on the positive selection plasmid, only the cells owning a functional aaRS survive. That is due to the amber stop codon on the kanamycin resistance. The resistance is only expressed, when a non canonical or endogenous amino acid is incorporated as response to the amber stop codon. Thus, the aaRS are selected for its function. 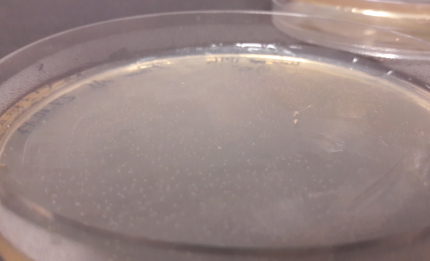 To avoid an additional pressure on the cells, we did not used tetracycline or chloramphenicol for the cultivation, due to the dependency of the kanamycin expression on the library plasmid and the positive selection plasmid. Figure 3: First positive selection round. Remaining colonies while the positive selection for 2-NPA, containing the pos selection plasmid and the library plasmid. Only cells, owning an aaRS which is as specifically that it does not bind an endogenous amino acid survived, due to the expression the barnase when responding to the amber stop codon and therefore binding of an endogenous amino acid. From the negative selection, we received < 100 colonies, showing a loss of more than 80 % of the aaRS candidates with which we first started the positive selection. Figure 4: Remaining colonies while the negative selection and after the positive selection for 2-NPA, containing the neg selection plasmid and the library plasmid. The remaining cells own an aaRS, specific to not bind an endogenous amino acid. Red colonies own a positive selection plasmid as result of the plasmid isolation and can be separated for further selection rounds easily. We combined the positive selection plasmid with a strengthening system (BBa_K2201373) , containing a T3 RNA-Polymerase with a reversed mRFP under T3 RNA-polymerase. With this system, the mRFP is expressed, resulting in a red colour of the colonies, still owning this positive selection plasmid. Thereby, it was possible to easily identify the clones owning the positive and not the negative selection plasmid while the negative selction. As it can be seen in figure 9, the transformation efficiency of the positive selection plasmids, in contrast to the library plasmids, is low, resulting in one single false colony owning the positive selection plasmid.